An entire college basketball season has been boiled down to just three more match-ups. AT&T Stadium in Arlington, Texas will host this year's Men's Division I Basketball Final Four. The semifinals will feature #1 ranked Florida facing off against the UConn Huskies. On the other side of the remaining bracket, the 2012 champion Kentucky Wildcats will battle a tough Wisconsin Badger squad. The two winners will play for the title on Monday, April 7th. Suntime is excited that all four teams are partners and we have 2014 Men's Division I Basketball Champions products in the works! If you sell any one of these teams, contact your sales representative or call 1-800-659-2824 to find out how you can receive your champions product as soon as possible. FANFARE TRIVIA: Name the seven schools that have had ten or more Final Four appearances in Men’s Division I Basketball? The Sport Steel is one of our best selling timepieces and is available with a Gameday or AnoChrome dial! Our handsome, eye-catching Sports Steel watch comes with a stainless steel link bracelet. A date calendar function plus a rotating bezel/timer circles the scratch-resistant crystal. Sport the bold, colorful, high quality logo with pride. Have questions about how to get the Sport Steel timepiece in your store? Talk to our sales representatives to find out more. Call 1-800-659-2824 today! This stylish dog tag is a great way for your customers to demonstrate their commitment to their favorite team. These aren’t just any ordinary dog tags. Our jewelry quality, solid alloy dog tag has embedded within, a die-stamped, cloisonné medallion that has been meticulously decorated with vibrant team colors. Our rugged collegiate dog tags come with the classic and secure, beaded chain and are packaged in a clear poly envelope that hangs for easy display. Have questions about how to get these collegiate dog tags in your store? Talk to our sales representatives to find out more. Call 1-800-659-2824 today! Did you know that all Suntime watches are assembled by hand? We print all of our collegiate licensed watch dials in our Clearwater, Florida facility. This means someone has to put all of our watches together just the way you ordered it. For this most important task we rely on the precision, speed and teamwork of Chien and Tim. Together they can build over 230 wristwatches daily. These same master watch technicians also handle any warranty work or battery changes for any Suntime timepiece. 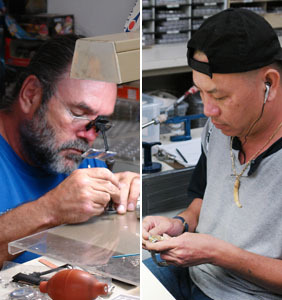 Remember, the next quality Suntime watch you sell was probably "assembled with care" by our specialists Tim or Chien.